I LOVE HALLOWEEN it makes me want to scream!!! Today I am going to stir up a beauty filled bewitching brew.It isn’t just about the candy!!! Although I WANT CANDY TOO! It’s about your skin and body. Here is a bewitching brew that’s healthy for your skin too! 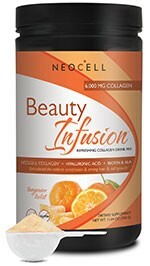 Beauty Infusion by NeoCell is a refreshing collagen drink mix. formulated for a more radiant complexion and strong hair and nail growth. NeoCell it contains these super ingredients: NeoCell Collagen,Hyaluronic Acid Alpha Lipoic Acid,Vitamin C and Biotin all which do their part to make you more gorgeous and your skin hydrated and pretty. I am NOT a sale representative just am passionate about the skin loving ingredients and beauty supplement products. Today in my makeup studio and on TV the other day I showed this simple recipe. Fill a pitcher with water and follow the serving suggestions on the bottle. Pour into the cauldron or punch bowl it will make a lovely looking orange drink. Serve in little witches cauldrons or orange shot glasses. So fun! Our clients can’t get enough of them.It also comes in Appletini and Cranberry besides the Tangerine Twist flavors. A natural solution for youthful,radiant beauty that starts from the inside. Say not to BOO-TOX and Hello to Beautiful healthier looking skin without injections or plastic surgery!